I just return from another full month in Mozambique and I am now taking the time to share my thoughts about what happened. 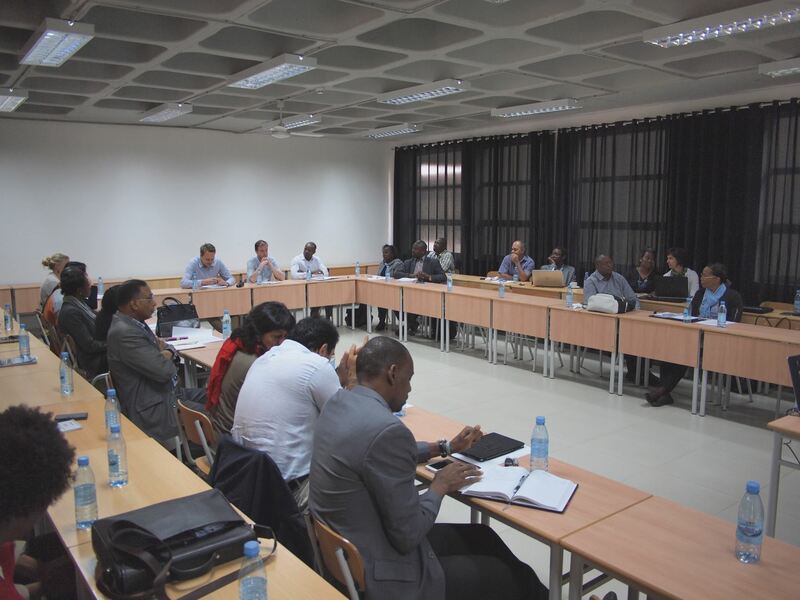 On the 4th of August we organized the first water reclamation symposium in Maputo and it was a success. We had almost 40 participants from government and non-government organizations based in Maputo, including Águas da Região de Maputo (the large public water provider), AFORAMO (an organization that represents local private water operators), ARA Sul, Municipality of Matola, Municipality of Maputo, National Directorate of Environment (Direcção Nacional de Ambiente), National Institute for Water Research (Instituto Nacional de Investigação em Água), National Institute for Agronomic Research (Instituto Nacional de Investigação Agrária), WSUP, Pamodzi and Livaningo, among others. We were very happy with the feedback received from the participants. Everybody understands the project and realize its relevance potential in addressing some of the issues that Maputo faces, in particular water scarcity. You can find the program here and you can contact me directly for a copy of the presentations. A general view of the symposium. This was an objective that we had defined for this year. 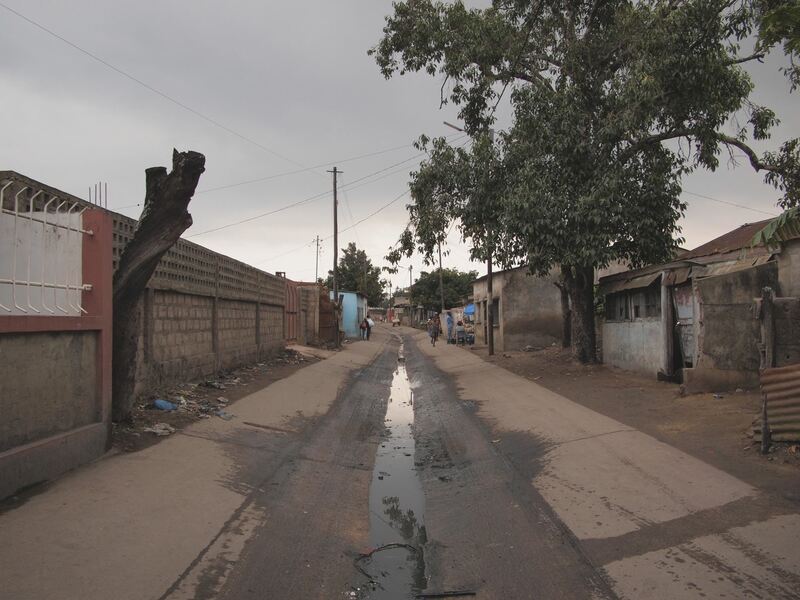 The coordinating group brings together some of the most important institutions in the water and sanitation sector in Maputo and they will have privileged access to our work including preliminary results and reports. Given the group’s feedback, our objectives, case-studies and methodologies can also be adapted. With this approach we expect to maximize research uptake, one of the main objectives behind NWO’s Urbanizing Deltas of the World Program. We will be meeting with the group twice a year and report as often as necessary via email. Another objective for this period was finalizing the mid-term review (MTR) for NWO. The draft version was previously shared with NWO, we received feedback from external reviewers, and the final version is due on the 15th of October. In the MTR we will be including detailed feedback from the stakeholders and conclusions from the symposium. 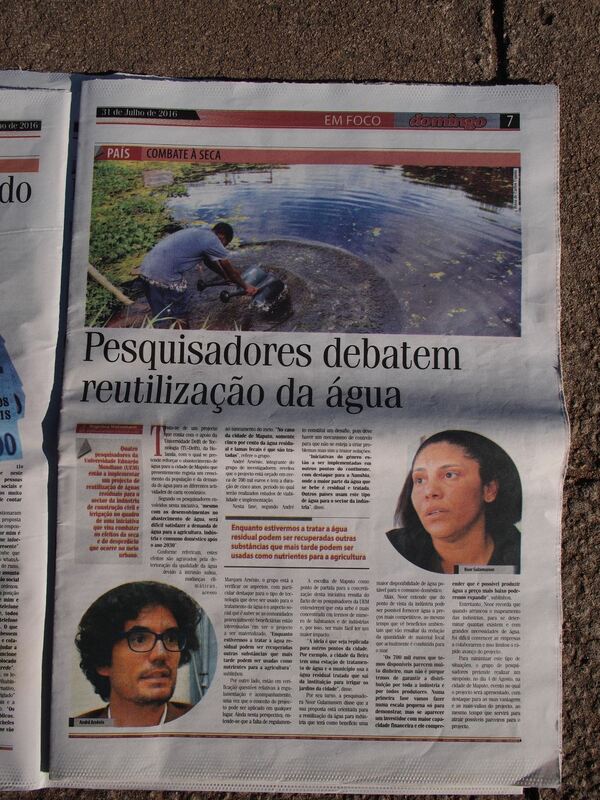 With the realization that water scarcity is a major issue in Maputo, we are now having plenty of media coverage with two interviews on National radio, one interview on the National TV, two newspaper pieces (this one, and a second with an interview to me and Noor, you can also find a photo of the interview below) and radio, newspaper and TV coverage of the symposium on the 4th of August; and all this in just one week! On the one hand this demonstrates the interest from the local stakeholders and, at the same time, gives weight to our message – we have all seen the stickers “as seen on TV” on many products. Our fifteen minutes of fame – being interviewed for Notícias, a national newspaper. As in other opportunities I had the chance to meet with Iana, Jay-el and Jesper. Unfortunately, Iana and Jesper left the day after I arrived so we only met once. Nevertheless, Jesper stayed a while longer and we met several times. They are all now finishing their MSc thesis and the results do look very interesting, you will have the opportunity to download their thesis in the upcoming weeks. We approached CRA to participate in the 2016 edition of AQUASHARE (read here or here about the 2014’s edition) and they proposed a sponsorship from TU Delft. After some internal discussion we found the necessary funds (thanks TU Delft | Global Initiative) and we are now deciding our participation, including topic to be discussed, format and speakers. Stay tuned because more information will follow in the next few weeks. This has been taking too long but we are almost done with it. While in Maputo I had the opportunity to meet the people at the World Bank (Lena joined via phone conference) and we agreed that the final version of the report has enough quality to be published after a few minor changes. This is another update that you will not want to miss until the end of this month. I made some feedback clips and I still have to edit them and make them ready for sharing and to publish this documentation I am now working on a media channel. We will also be sharing the some of the interviews that we gave in Mozambique. We attended this year’s first GAS meeting – they had not met in more than one year. 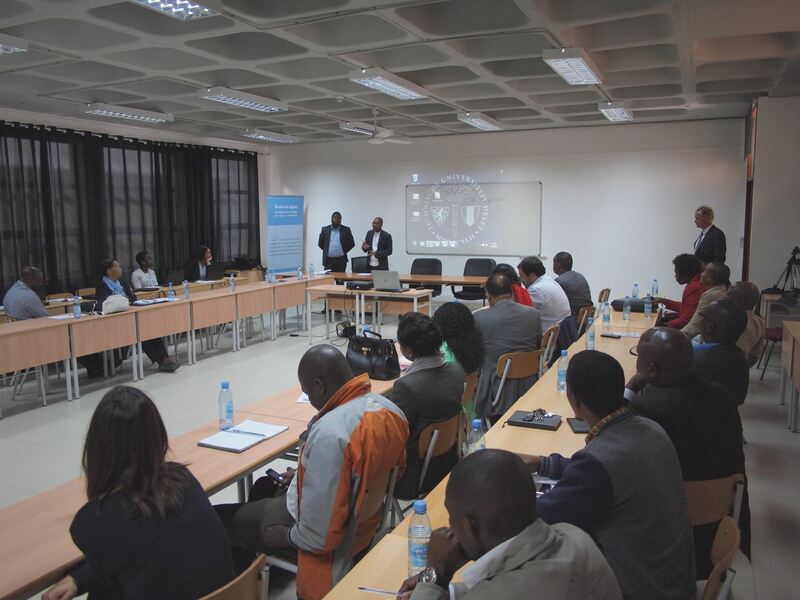 GAS is one of the most important platforms for water and sanitation in Mozambique and it brings together government organizations, NGOs and practitioners. For the next few years the meetings will be hosted by Direcção Nacional de Água e Saneamento (DNAS), with the people at WaterAid being secretaries. One of the discussed topics was GAS’ new website. I proposed to build, host and maintain the website and we are now starting this process, looking for a domain, a host and a template. Oh, and we (me and the PhD candidates) are also members of GAS and have started attending the monthly meetings. 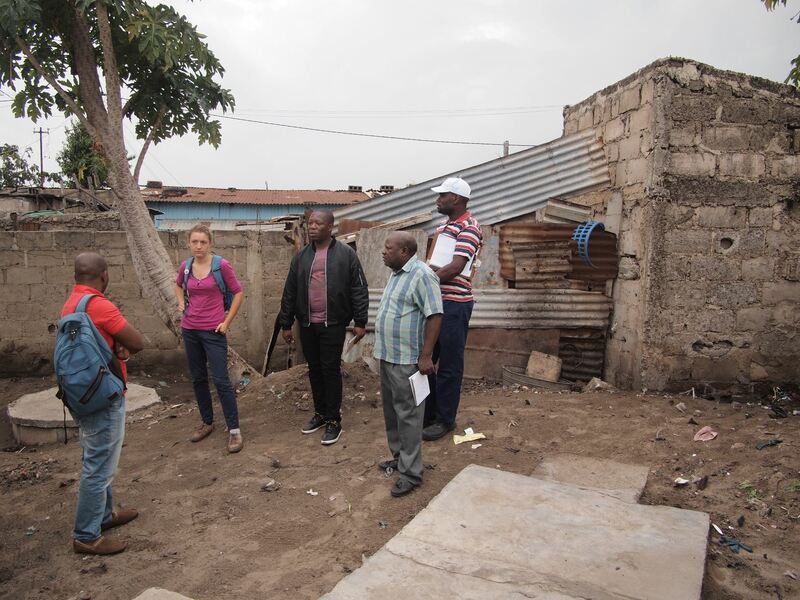 As before this period in Maputo gave me the opportunity to meet several stakeholders and see their work first-hand. One of the highlights was joining WSUP to a visit in Mafalala to where the British NGO is planning to expand their Revolving Fund project. This fund works in the following way, with money made available by WSUP, a local CBO (usually at neighborhood level) offers a loan to a household to build improved sanitation infrastructure; at the beginning the loan was enough to build an improved latrine but the households tend now to favor the construction of septic tanks. The loan is only given after the CBO has evaluated in detail the capacity of the household to repay the debt. The household is then expected to pay the loan throughout 12 months. The loan is interest free and the CBO makes money by keeping construction costs low, through economies of scale, e.g. acquiring the construction materials for several systems at the same time. Another great meeting brought together AIAS, the Municipality of Maputo and WSUP. We discussed the planned refurbishment of the wastewater treatment plant and the non-operating pumps (an ongoing discussion subject here on the blog as you can see here, here or here). I am still not sure where this is going and when everything will be operating as projected but everybody is doing their best, I hope to have some developments until the end of 2016. Finally, on a personal level a major highlight was the basketball season 2016 of which I watch more than half of the matches. The first phase was won by Ferroviário de Maputo with 8 wins in 8 matches; Maputo was from the beginning a pleasure to watch and it became my team. During the first phase, Ferroviário da Beira followed in second (7 wins in 8 matches). Both teams also won the final four and went to decide the national title in five very exciting matches, with Maputo winning 3-2 after being behind at 1-2. Unfortunately, I missed the final and decisive match but my team won. 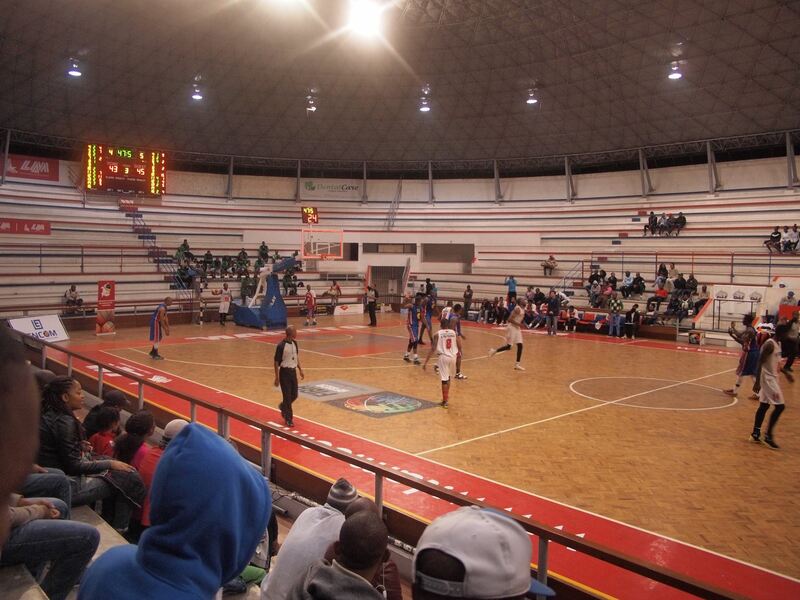 This period in Maputo also allowed me to discover an interest for basketball and to find a team to support. To celebrate Ferroviário’s achievement I even bought their jersey! If you are in Maputo during Basketball season, don’t miss the opportunity to watch a couple of matches. Basketball in Maputo. You can always expect low attendances in the first matches of the season. This entry was posted in André, general, information and tagged AdeM, Conselho Municipal de Maputo, CRA, Delft, maputo, mozambique, Municipality of Maputo, PhD candidates, pumping stations, sanitation, sewage network, sustainable, UEM, wastewater, water, water reclamation, water reuse, water supply, workshop, WWTP by André. Bookmark the permalink.